A well planned corporate event can give your new product the launch it needs, your company the publicity it deserves, or your staff the celebration they worked for. It’s easy to get lost in the details, but there are three things you don’t want to overlook: developing a unique and specific vision with accompanying goals; finding a narrative that encompasses that vision; and deciding on the perfect setting. In short, the vision should include the underlying purpose and any specific emotion or action you want to convey. 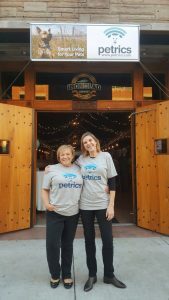 Take our recent launch party for Petrics. This pet technology company wanted to launch their Indiegogo campaign in a fun and interactive way. Our goals were to create brand recognition, begin fundraising, and instill positive company impressions. We envisioned a party where pet owners could meet the CEO, enjoy a beer, and not have to leave their pet at home. The narrative around your event is what draws people in and how the event will be remembered. This includes naming, press releases, signage, and social media posts, as well as partnerships and sponsors. For Petrics, we chose the title “Pet Fete” because of the memorable rhyme scheme and celebratory connotation. Inviting animals, local pet businesses and nonprofits to the event was also part of our narrative as it gave a fun twist and emphasized Petrics community ties. When choosing a location, consider attendance expectations. A large venue provides more space, but looks empty if attendance falls short. However, any location is useless if people make other plans. Remember to check local calendars for large, public events in the area. Also, be sure to consider national and religious holidays that may lead people out of town or complicate their schedule. If you are not serving food, consider whether or not your event is during a meal time. People will have to eat before or after, so schedule between meal times or later in the evening. The Petrics event ran from 4pm to 8pm on a Thursday in November. People were able to drop by after work to enjoy finger foods and an open bar at Ironclad Brewery. Hosting an event can really draw attention to your company, but extra preparation and attention to details, like other events, creating a narrative, and setting achievable goals, can be the difference in a good event and a great event!